To the north of the Thunder Mines and down the long twisting stairs from the Hall of Bronze are the flooded mines. These were the first set of mines worked by the local dwarves and were mostly worked out when the dwarves partially sealed them off in favour of the hematite mines. Originally built around the river that creates the falls in the thunder mines, the water flow in said river continued to increase while the dwarves were working these mines. Eventually it overflowed into the lower areas of the mines themselves. Through most of the wet areas water is roughly two to four feet deep, with the most northern room and associated tunnel being completely submerged. Like the two other mine maps, this map is drawn at a scale of 1 square = 20 feet (or 1 inch = 100 feet at 300dpi). Initially the danger of this level would appear to be the slimes and molds that are found within the dank environment. But dark things have crawled in from the waters. A foul mastermind of a beast crawled in along the Lost River cave and into the mines and has settled into the chamber just north of the waterfall and source of the smaller river. From this location it has sent it’s minions out to collect materials and based on the genetic materials collected (from an unlucky adventurer) has birthed a collection of nearly identical human-seeming creatures under its control. As they don’t speak, they have been named “the brotherhood” by those other factions that have encountered them. Also swimming the waters of this area are the true children of the mastermind beast. These little non-sentient monstrosities swarm in the water wherever they encounter food or blood. Any serious adventuring in this area will first require wiping out the thousands of these little toothy bastards, or keeping the whole party above the water at all times. 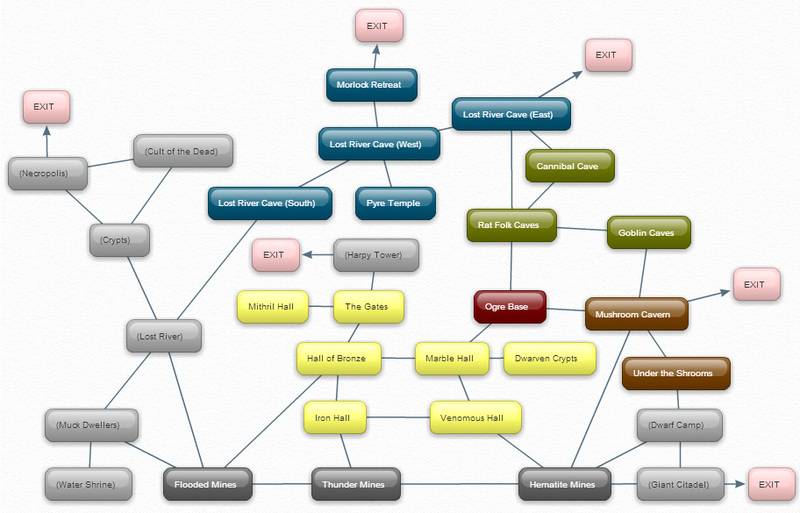 Here’s the current node map of the Mega Delve – only nine nodes left to map! I am more of a lurker, but I must tell you that your maps are beautiful. The technique you use produces wonderfully oldschool artworks that remind me of old Steve Jackson books and HeroQuest. 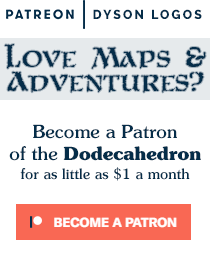 It would be awesome if you put all these delves on the next issues of Dodecahedron. There’s too much content for a Dodecahedron. 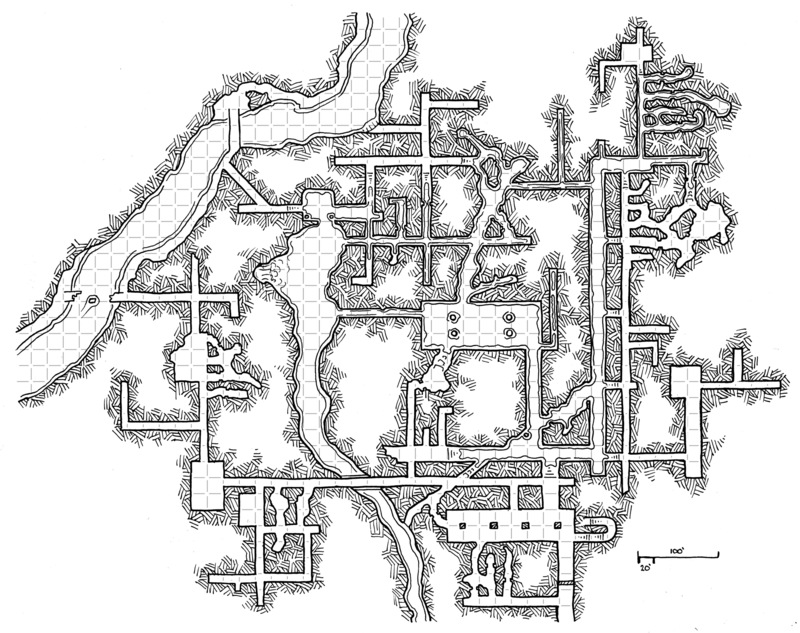 The goal currently is to assemble them all with a drop table for wandering monsters for each level along with 2-4 pages of content for each map in a book or boxed set.